The first President I remember is Dwight Eishenhower. The Commanding General of Allied Forces in Europe during World war II, he is mostly remembered as a taciturn and reserved fellow. This book will dispel that notion. Written in 1965-6 and published in 1967, this book is an unusual insight to a most unusual man. 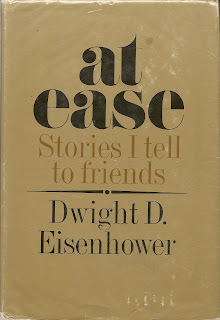 While the years of his Presidency are known for their “Father Knows Best” type atmosphere- bland, black and white - everything perfect- this book displays a side of Eisenhower we don’t really see or hear of too often. This book delves only slightly into his family history- the story really begins with his appointment to West Point in 1911. One big surprise to most readers will be that Ike never saw combat in the First World War. He was assigned to the Quartermasters Corp. And the Ambulance Corps. And the fledgling Tank Corps. These assignments would take him on a cross country trip at the end of the war- testing tanks and rewriting battle tactics. This was also the period in which Eisenhower became interested in road building in America- envisioning a 2 lane cross country highway along the lines of the nascent Lincoln Highway- at the time the best road in America. As we all know now- that idea was bolstered by his service in Europe in World War II and his admiration for the German Autobahn. This led to his efforts, as President, in establishing the present day Highway system that we have all come to depend upon and bears his name. It is during these first post war years that he forms a lifetime friendship with a returning Veteran of the Combat in Europe- George S. Patton. Having had experience in battle with French Renault tanks made him a very desireable friend for Ike and the two lost no time in concentrating their efforts on “rewriting the book” so to speak on tactics. The book covers the Panama troubles in the 1920’s and 30’s- the Bonus Army in Washington in 1932 and some of the World War II years. The book is written plainly and captures the style of Eisenhowers demeanor- in a word- measured. Loaded with anecdotes and stories of his many travels, this book is a very enjoyable and interesting read- sort of like having your Grandfather telling you about the old days.